The last few weeks have passed in a blur of activity. I've had more fun than the legal limit. I want to share just a few highlights with you--I wish I could sit and write an entire travelogue, because there have been so many moments I never want to forget. Alas, time is short and this post needs to go up! Please bear with me if this seems a bit self-indulgent. At left was me at my BookPeople event in Austin, Texas with my hairstylist of nearly 15 years, Fannie. Her personality is VERY much the inspiration for Dorrie in Calling Me Home, though she'd never do many of the things Dorrie did and vice versa. Dorrie's life and situations are fiction, but she wouldn't exist without the presence of this beautiful, generous, hilarious, amazing person in my life. Fannie recently moved, leaving me to cope with finding a new hairstylist. She's the recipient of many whining texts as I search. But there are also texts and phone calls about our kids, our heartbreaks, and our joys. She was hairstylist first. Now, she's my dear friend. 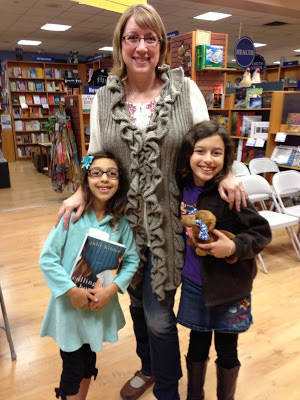 These little charmers are smart girls who read--and I believe they might even be writers one day. I've known them since before the youngest was even born, though I hadn't seen them in a while. One shares a name with one of my characters, and I was thrilled to autograph a copy to her, and share that with her. The other already has the ability to read Calling Me Home, though her mother will screen each chapter as she goes to be sure the maturity level isn't higher than she can handle emotionally at this point in life. Girls like this are the future of the United States, and it is so exciting to see their parents bring them to events like an author reading/signing, and watch the wheels turn in their heads as it occurs to them that careers can be made from the passions that burn inside them. The feeling as I held their sweet heads close to my heart was beyond description. My son, Ryan Pickop, released his first full-length CD the same week Calling Me Home launched, and he shared a release party with me at a cool little bakery venue in Waco, Texas. I was honored to read and share a bit about the book, and humbled to watch my son play his music and sing the amazing lyrics that come from his brilliant brain. He's more writer than I'll ever be, and I am so very proud of him. His CD, Lie in the Leaves, is about life and death, grief and celebration. You can listen to his songs and purchase it here. Finally, this last photo is quite possibly from the highlight of my book tour so far. I talked and signed books at the Tattered Cover in Denver, which meant so much to me as I spent my junior and senior high years in Denver and grew up in the stacks of the original Tattered Cover in Cherry Creek. 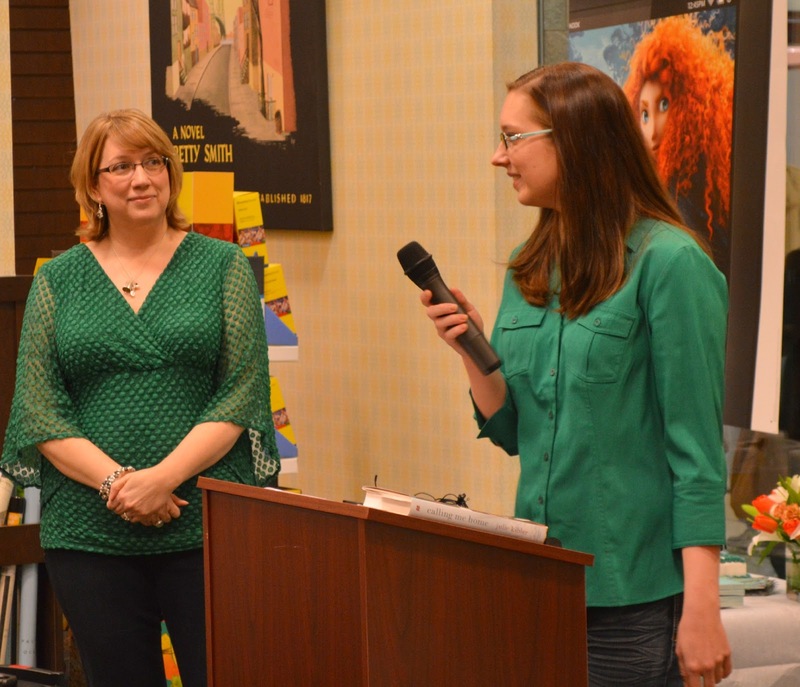 Reading at the Colfax location, which was a former theater I visited for field trips as a student, was a blast. I was surrounded by friends I've made in Colorado from the age of 15 until less than two months ago at the Pulpwood Queen's Annual Girlfriend Weekend (read about Alyse Urice here). Authors Barbara Samuel/O'Neal and Carleen Brice, who both blurbed Calling Me Home, were in attendance, and I loved being able to hug every one of these folks in person. But my most meaningful moments in Denver were spent at Manual High School. I graduated from there many years ago, and leaving those rooms behind was a bittersweet celebration. My years there were some of the hardest of my life. I was painfully shy. My family life was in turmoil. I didn't fit in at school. I was neither a minority kid who lived in the school's inner-city neighborhood, nor one of the kids bused from the wealthy neighborhoods further afield. I lived in a small house with my struggling single mom and my brother, in a transforming neighborhood with few children. The unlikely friends I made were often decades older and different in so many ways. 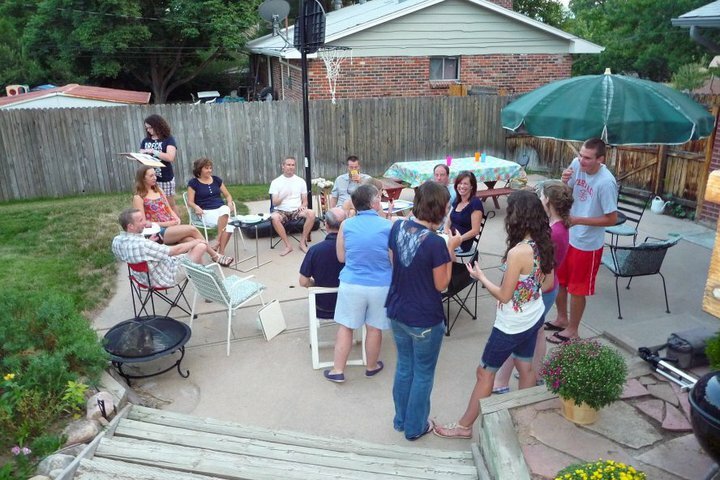 I had a close-knit group of friends at church, but my close friends were not at school, as a rule. I went about my days with my head down, lifted occasionally by the teachers who saw some glimmer in my schoolwork that indicated I might one day be a writer and nudged me that direction whenever possible. This first public high school in Denver has a long, troubled history. It has reinvented itself several times, and has been closed and reopened because of dismal passing rates. The New Yorker magazine devoted a long feature to Manual several years ago because of its challenges. I stopped by Monday morning in the aftermath of a snow storm, unsure whether I'd be welcomed or viewed with suspicion. I took a few books with me, hoping to give them to the secretary or librarian to add to the school's collection. Instead, I ended up talking to the vice principal, who then took me to meet some of the English teachers, and before I knew it, I was talking to a classroom full of students, sharing a little of my history at their school, a little about my book, and reading a few scenes. I returned the next morning to talk with another class. These are kids who might have given up on the system, but the system keeps trying not to give up on them. Their teacher told me every single student is affiliated with a gang. They deal with things most of us could never even imagine dealing with as an adult, much less a kid. But they were curious. They were intelligent. They were mostly polite, or shushed by their classmates if they weren't. They wanted to know why I was there, why I'd written a book about an interracial relationship, why I'd decided I could make it as a writer, why I'd bothered to come talk to them. We talked about voice and point-of-view, pre-writing, revising, reading our work aloud. In the class on the second day, I read the short scene from Calling Me Home where Dorrie shares her fears with Isabelle about the trouble she thinks her son might be in. As I read, one young man, who tried to unnerve me at first with a series of loud questions, not allowing the other kids to speak over him, became very quiet. He listened intently, and when I finished, he said softly, "I'd read that." My heart overflowed. I see him here in this photo, listening. I think one day he'll accomplish bigger things than he can even imagine while he's a junior in this school that refuses to quit on him. Just like me. I took a journal with me to China. If there is a book to be written of my adventures in that foreign land, then I was determined to arrive prepared. I have traveled by myself many times before, but never in a city where I did not speak the language. I was truly alone. All alone to lug my wheel-less carryons, to navigate a layover in Seoul’s Incheon airport, to arrive in Beijing with a borrowed cell phone and a nervous smile. I mentioned in my Calling Me Home post how shocked I was at the air quality. From the first step off the plane, the stench assaulted me. On the route toward immigration, it slightly dissipated, then grew stronger. From the workbench in our garage, I had smugly tucked away a utility mask to protect myself. After snapping the elastic over my head, I realized immediately how useless it would be. Particles of coal dust infiltrated the airport, so while waiting to clear customs I tasted it on my tongue, mask be damned. As I reached the exterior door, it grew into an ugly dragon’s breath, permeating my nostrils, my bespecled eyes, my hair. On the first morning I looked out the picture window on the 5th floor of my hotel’s breakfast room to find a grey haze of the previous night’s burned coal hanging over the city like storm clouds. Despairing tree limbs wilted from the oppression, while masked city dwellers plodded through another day. Mothers bicycled past with their bundled children in tow, to or from the long day in a city that seems poised for an apocalyptic melt down. The atmosphere might be drab and brutal, but the people I worked with were bright and joyous and positive. This is their home, after all. I am the foreigner. They instantly welcomed me to the company and took me to lunch for Peking duck. One woman, a young mother who traveled from Tianjin to work with me, took special care of me, linking arms with me as we waited in the dark for a cab and delivering me to my hotel room each night. She spoke little English, but we always seemed able to communicate. Her work ethic was as brilliant as her smile and when she answered a question, she always started with a sing-song “for example…” I close my eyes and hear it still, smile on my face. At night I fell into bed, too exhausted to write or even read. But I did jot notes in stolen moments. Such is a writer’s life, to always wonder where your next book will be set, which traits of acquaintances or passersby can you memorize, whether the whining, black-lunged cat will be rescued by my next character, if there is a scene to be captured from the night I arrived for an overnight layover in Korea. At one a.m., after traipsing from one end of the airport to the other in search of the transfer hotel, I sobbed when an airport security guard kindly commandeered my unwise carryons and escorted me to the hotel check-in desk. I might have arrived in China armed with a journal and mask, but I wasn’t prepared for just how foreign I would feel in a land others call home. My first draft of my first novel was over 100,000 words. For whatever compelling reason, I couldn’t stop writing it. I added subplots and additional characters and points of view. I added description and three full generations of multiple families. It was sweeping, spanning over sixty years. It was broad, but not necessarily deep. I added everything I could possibly think to include. 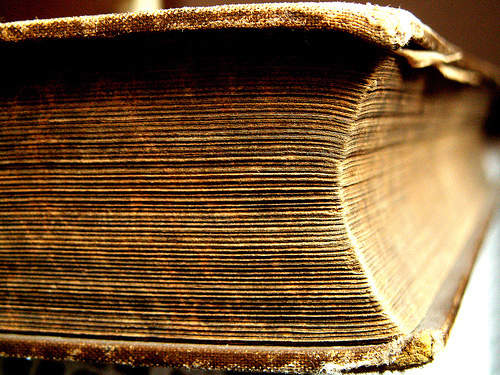 If I was going to write a novel, I surmised, I should put everything I’ve ever known into it. That sweeping novice attempt garnered me an agent, but no book deal. Six months of revisions, followed by a quick testing-of-the-waters submission (that we just as quickly pulled after five rejections and five amazingly similar snippets of feedback) led to my decision to embark on a complete rewrite of the story. A rewrite, I am proud to say, that I finished this week. The current product? One story-line, one time period, one generation. 88,000 succinct words. I taught myself to reign in my storytelling. The original draft wasn’t really one book, it was a minimum of three competing and overlapping stories, all crammed into 100,000 words. This closer-to-final product became a journey of learning to write more while writing less. I’m calling it writing short. By writing short, I’ve stretched new muscles. Over the course of this novel rewrite, I’ve also written quite a bit of poetry, a children’s story, and a myth. In my practice, I learned to tighten sentences and to pack as much punch into a scene, character, or description as possible. Writing short also means writing deeper. With fewer characters, I learned to focus and to develop the ones I was left with. The end product? It’s a much better book and, as a student of my own process, I’ve become a better writer. I think some of my friends may have thought I was crazy for embarking on a full rewrite. Taking 100,000 words and slashing it to less than 30,000 and rebuilding it in four months' time was a daunting process. Yet I’ve learned that more isn’t necessarily better. I learned that finding the poetry inside prose is a delight. More than anything, I’ve loved learning a better way to tell a story. Hello, my name is Pamela and I'm an online shopper. Amazon is my biggest crush--books and movies, clothes and shoes, Luzianne family-sized green teabags and Wellness Ocean Core grain-free dog food. What's not to love? I could wax on about the convenience of shipping, the customer service and the fact that I can shop in my jammies, but I'm afraid an intervention might follow. Yes, I am Amazon-addicted. But in a good way, methinks. My morning email box contained a couple notices asking for feedback on recent purchases, which led to my thinking about reviews. Yes, I read them and write them. And I'm aware of Amazon's recent push to oust those who give glowing reviews of books-by-friends-and-family in order to sway purchasers. There are even people who will review your book or product for a fee. I've never been paid for a review and wouldn't dream of it, but I wonder if I've ever been duped into a purchase by a false review. Maybe and maybe not. I also post reviews on GoodReads. While I'll rarely devote the time to write out a review, I do at least hit the star option and leave my opinion in a click. What I noticed is my proclivity for 4- and 5-star reviews. Do I love every book I read? No. But if I finish a book, then chances are I really liked or loved it. A book earning less than four stars by me likely got set aside in favor of another book waiting nearby. So there it languishes, on my virtual GoodReads 'currently reading' shelf, gathering virtual dust. So, my challenge to you is to be fervent in your reviewing. Be fair, honest and kind. 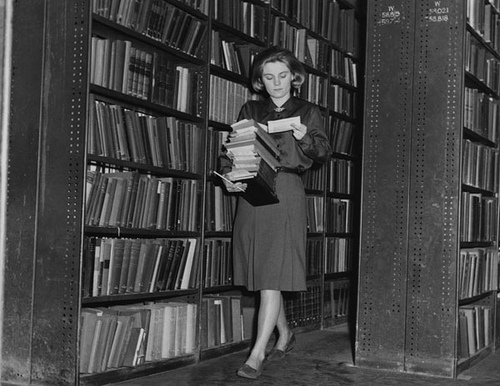 If you really liked or loved a book you read, take a moment and share your opinion in an online forum. You can even go a step further and let the author know (via her website or Facebook page) how much it meant to you. Didn't love it? If you post a negative review online, make sure you're judicious in the kindest way possible. Be a reviewer, but in a good way. When I wrote my first completed manuscript, I used the hours my daughter was in pre-K to settle myself into a coffee shop across the street from her school, and with my pen in hand and a twenty-five-cents-on-clearance notebook, produce something like fifteen hundred words in an hour long stretch most weekdays. 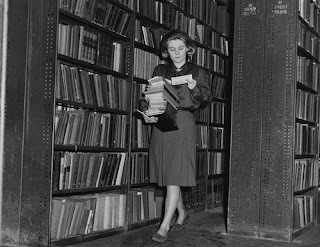 It was pantsing to the extreme--that book had a lot of characters in its earliest versions--and I never knew who or what I would be writing about until I sat down and had at least the first cup of java down my gullet. With my second completed manuscript, I let my Thursday night critique group deadline propel me. Once a week, I had a new chapter to read, whether it was done the night after I got home from the last one, sometime during the week, or even up until the last minute before I headed out the door for the 7 p.m. rendezvous. I got a chapter done every week, and eventually that meant a finished product. With my third-ish manuscript (there are others, sure, but really more snippets than "manuscripts"), which I did not finish (yet, the day may yet come, though it has been cast aside for now), I began with NaNoWriMo. Though I technically succeeded, finishing 50K words during that long exhausting month, it was not a good experience, and those words did not make a complete book. Over the next couple of years I added dribs and drabs without any real formal structure propelling me, and like I said, that never did get the thing done. The first two methods worked reasonably well, but I've had trouble returning faithfully to either. The third method I'd have to be crazy to revisit; it was not a good experience, nor do I feel the stuff I wrote was of the same level of quality than words that weren't under such a gun. So maybe it's time to try something new. This weekend I got what is essentially a new computer. That just means the guts, I suppose. My husband, who went to the store and bought the parts and spent the better part of the weekend upgrading and installing or something, I don't know, would occasionally try to inform me exactly where he was on the thing, but me being me, it might as well have been Etruscan he was speaking. Computer language starts, my brain flips to off. But once he was done, I can definitely tell the thing is new and different, and not just because my msn.com looks different, but because though the keyboard and monitor are the same, the whole thing works faster, is more responsive, and just better. For Christmas, said computer-savvy husband got me a new gadget intended to help me with my writing. Since my old computer was basically dying, we were both loathe to install the software in case it caused the whole teetering mess to finally crash over the cliff (that is totally my description, not computer-savvy-husband's, who would surely object to my analogy as illogical and incorrect). But now the new machine is ready and rocking, and all I need to do is read the instructions and get going. Which will hopefully mean that the new system will join the coffee shop and preschool methods in helping me complete a manuscript. And better still, maybe become the method that helps me complete the fourth, fifth, and many more to follow. If it works, I'll let you know. Until then, I'm keeping mum. I don't want to risk the magic. All of us here at What Women Write have been thinking a lot about “home” lately, thanks to the release of our own Julie Kibler’s debut novel, Calling Me Home. We’ve weighed in on what we consider home to be and what it is about that place that calls us. I wrote my post about a place I’ve never actually lived, but with which I feel a primal connection. I was in the midst of a major revision of The Oak Lovers at the time, and it struck me that my great-grandfather and I both had spiritual homes far away from where we lived. (He pined for the far north of Ontario and I long for Georgian Bay.) We’ve also both had many physical homes. While I fictionalized portions of Carl and Madonna’s lives in order to make a compelling narrative, their various “homes” in the novel are real places, many of which still stand today. I thought it might be fun to share a few of these. One of Carl and Madonna’s first homes was this Eli farm wagon. Carl had been commissioned to paint the old California missions in the summer of 1906. Motor cars weren’t allowed on mountain roads, and so this served both as their mode of travel and their residence. This photo was taken near the mission at San Diego. Madonna, then about four months pregnant, is doing the laundry. Carl almost certainly held the camera. This photo was taken at Carl and Madonna’s Toronto residence (1909-1911), likely by Carl, in the summer of 1910. All people in the photograph are characters in The Oak Lovers. The adults, from left to right are, Sarah Wainwright (Madonna’s mother), Madonna Ahrens, Isabella Hynds (Carl’s mother) and Richard Hynds (Carl’s step-father). The children are Dickadee Wainwright (Madonna’s half-sister), Penelope Ahrens and Laird Ahrens. This house still stands. 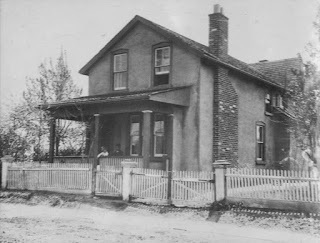 This is Carl and Madonna’s house in Lambton Mills (1911-1919). That’s Carl on the porch along with one of his daughters, probably my grandmother Chloris, who was born in the house. Lambton Mills is now part of Etobicoke, just west of Toronto. 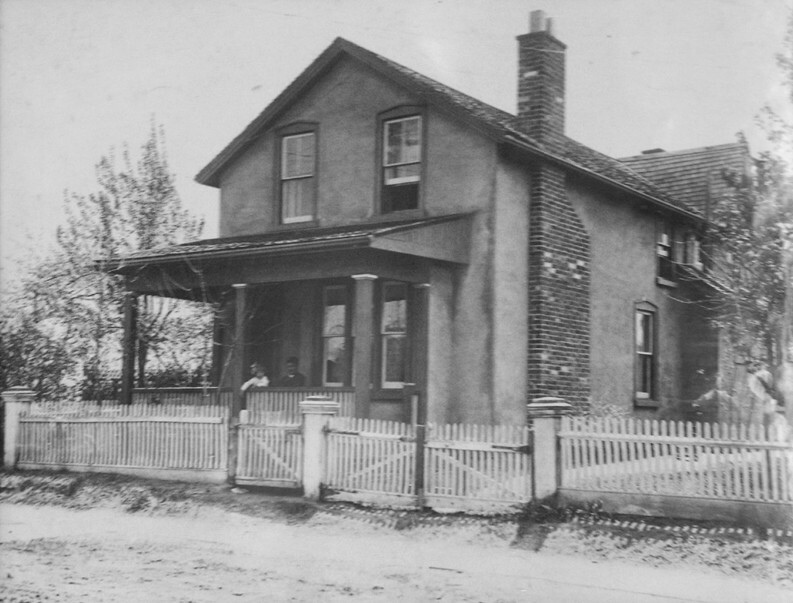 The house still stands today, though the porch is gone, as is the building Carl used as his studio. During the summers of 1913 and 1914, Carl and Madonna called this cottage home. It was located on the beach at Leith, a small village near Owen Sound on Georgian Bay. The baby is my grandmother, Chloris, and judging by her age, this photo was taken in 1913. Also in the photo are Madonna Ahrens and Sigrid Ahrens. The house has been torn down, but there are still summer cottages along this beach today. 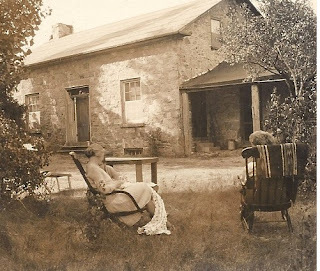 This photo features the house closest to Carl and Madonna’s heart, their Galt, Ontario, residence called Big Trees. They lived here from 1923-1935. That’s Carl and Madonna in rockers out front. Carl’s studio was in the small wing on the right. 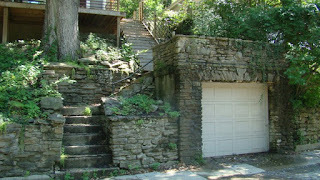 At the time, the house was a half mile from their nearest neighbors, but now the neighborhood is completely developed. Miraculously, the house still stands and has been beautifully taken care of. I visited the first time when I was eight and have been back three times since. Have any of you used real houses as inspiration for your settings, even if your characters are fictional? 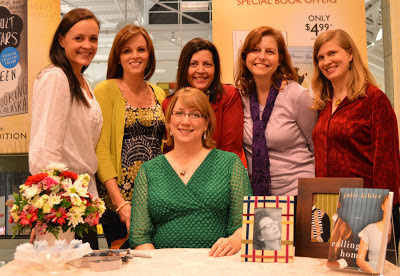 Susan, Pamela, Joan, Elizabeth and Kim with Julie at her book launch. Julie's daughter Emilie introduces her. We'd all patiently waited for The Day. This Day. The Day Calling Me Home grew from a much beloved manuscript into a novel held in the hands of Others. Not just us. But Others. Some we'd know because we had recommended they read it and love it as much as we did. Others we wouldn't. Others might hear about it in passing. Might read about it on a blog or in a newspaper or magazine. Others might be captivated by its glorious cover or intrigued by the text on the book jacket. Others would get to see how terribly talented our Julie really is. Julie tells the crowd about her inspiration for her book. And so we gathered at Julie's local Barnes and Noble in Arlington last night to celebrate with her The Day. As you can see by the photos, the crowd was a true crowd. Not a handful or a meager gathering, but a crowd. We attempted a headcount, but everyone knows writers stink at math (and apparently counting), and gave up at around 80 or 90 people as many stopped on their way into the store and stayed to hear Julie talk. Signing books and meeting friends. It was an emotional night for Julie. I know she has spent many a recent night getting little sleep as she prepared for the domestic release of Calling Me Home, but true to form, she stepped up to the lectern, gripped the microphone and wowed the audience with tales of how the story came to be. 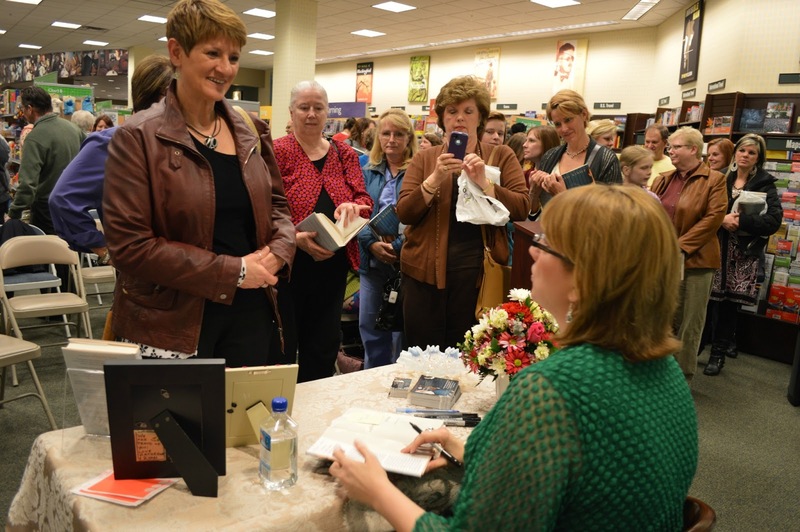 After reading a couple excerpts, she fielded questions and then signed books and posed for photos with fans. When we started this blog four years ago, each of us shared a goal of seeing our work published. Julie has set the bar high for us all by landing a great agent, securing multiple contracts--both foreign and domestic--and beginning an extensive tour promoting Calling Me Home. We could not be more proud of her! To find out where she'll be next, click here. To purchase Calling Me Home, helpful links are here. All photo credits: the talented and gracious Rick Mora. For more than a year, we've been awaiting a special day: the publication of Julie Kibler’s first novel, Calling Me Home, available now! If you are in DFW, please join us this evening for Julie's book launch and signing at 7:00 p.m. at Barnes & Noble, The Parks Mall, Arlington, Texas. Click here for more information. 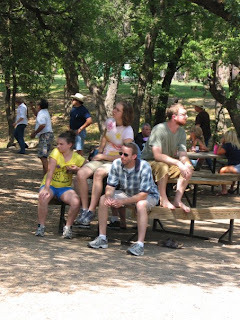 Other events are scheduled in Austin, Waco, Houston, Denver, Seattle, and Spokane. Find details at Julie's website or Facebook page. Calling Me Home is our group's first published novel, and it marks a major milestone for both Julie and the blog itself. We started this blog more than four years ago as an outlet for some of our thoughts on writing, but also as a platform to help introduce us to you, our readers, as writers looking forward to publication. That time is beginning. In celebration, each of us is sharing our thoughts on home, how it calls us, and what it means to every "me" in our group. We hope you enjoy these posts, and we hope to see some of you at Julie's launch! It’s here. Calling Me Home releases today in the United States. I can hardly believe it. Eighteen months ago, you couldn’t have convinced me this time would fly as it has. Eighteen months! Everyone said it would—I didn’t believe them. And now I’m ecstatic to be sharing my novel with readers everywhere. At What Women Write, we’ve been talking about what calls us home for the last two weeks. I’ve so enjoyed reading each post from my beloved blog partners. We have so much in common, yet we’re all unique. At the same time, I knew this would be a hard post for me to write. It’s a concept I struggle with. I moved so often growing up, I felt “homeless,” even if I was lucky enough to not be sleeping in a car or under a bridge or in a shelter, as those who are truly homeless do many nights. I thought getting married and having my own home might heal that sense of not having one, but during my young and rocky first marriage, I continued to move every six months to two years. After my divorce, I managed to keep my kids in the same house for six years. Then my second husband and I combined households, and we’ve lived in the same place TEN years. Six years was a record. Ten is a miracle. And yet, I still long for that thing called Home. For some, as Joan and Susan wrote about in their posts, it’s the houses where they lived forever, from birth until their parents pushed them out of the nest. For some, it’s the small towns or city neighborhoods they settled into, even if they lived at different addresses in those areas. For some, it’s where Grandma lives—where they went every summer to visit and run and play as kids, or where they take their own kids each Christmas or Thanksgiving to eat turkey and mashed potatoes and pie and play hide and seek with cousins. For many, home might have been a consistent place, but one that doesn’t necessarily bring joy now. Home is there, but lacks pleasant memories. For me, home is … nowhere in particular. I was born in Kentucky and moved back and forth between there and New Mexico, then to Colorado, where we moved from city to city until settling in Denver for my junior high and high school years, though in a few different houses and apartments after my parents divorced in the midst. When I left for college, my mother soon severed her tenuous ties to Colorado, following me to Texas when I had my first child. She was there to rock my baby boy when I was exhausted, and yet, I longed for “Mom’s house.” In her case, an impersonal one-bedroom apartment down the road wasn’t anywhere I knew intimately or wanted to visit. She trailed us as we moved again and again, and my kids don’t remember her houses or apartments because she mostly came to us until she eventually moved in because it was easier. One of my parents was an only child; the other had a much older brother. Our extended family wasn’t close enough to visit often. My dad moved far away not long after my parents divorced, and though we always kept in close touch, it was too expensive to travel. I regret never seeing the house where he, my stepmother, and my two half siblings lived in Alaska. They eventually settled in Washington State and though I’ve had the pleasure of visiting three or four times, their cozy house in Washington is not home. My family lives in a big, suburban Texas house. We can spread out comfortably in the blistering summers and windy winters. Yet after my last child graduates from high school, my husband and I envision moving to a house with more personality, in an urban, walkable community. We imagine patronizing locally owned cafes and shops—a place we might feel we belong. Whether or not it happens, I suspect it won’t feel exactly as we dream it might. Over the years, I ‘ve observed others with envy—sometimes, heavy sadness—as I listen to them talk of home, with the accompanying nostalgia or pride or frustration, claiming with confidence roots in one or two locales. Me? I feel like a bit of a fraud when I claim to be a Kentucky girl. Or a New Mexico girl. Or a Colorado girl. Or even a Texas grownup. When I write stories set in any of these states—which, of course I do—I compulsively run them by folks who can gently yet expertly guide me toward accuracy. Because I can’t claim complete, native authority on any location. As a result of this perceived deficiency, I’ve gained proficiencies others may not have. I can fake my way as a local nearly anywhere after a day or so. I can ride subways and trains and city buses like a pro with a map and a pass in hand, or rent a car and drive winding country roads. I can mold my accent to match the people around me so I don’t stick out much. I can scout out places beyond the tourist traps, and I can talk to almost anyone. And … I can claim to be “from” the same place as many people who don’t live near each other. But these days, I look for home in more than an address or community or culture. I look for home in the people I love. It’s the thing I can do. 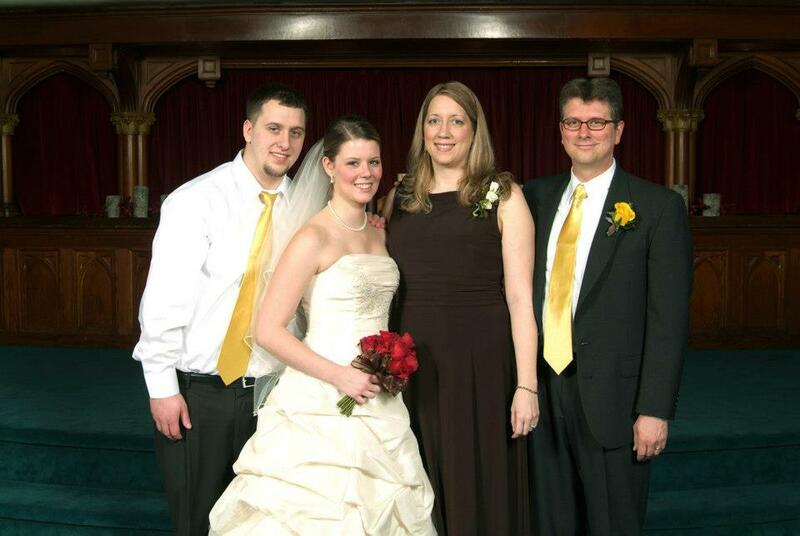 I treasure photographs like this—the only one of me with all three siblings, the one day we were all four in the same place in our whole lives, at my sister’s wedding. 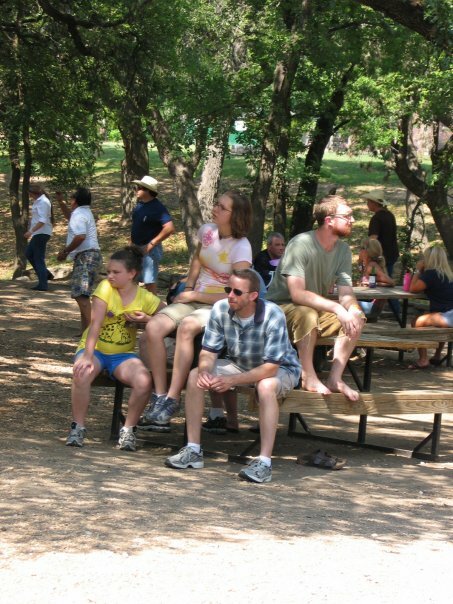 So I look a little like a linebacker—these are my brothers and my sister. I love that we have this photo to cherish. 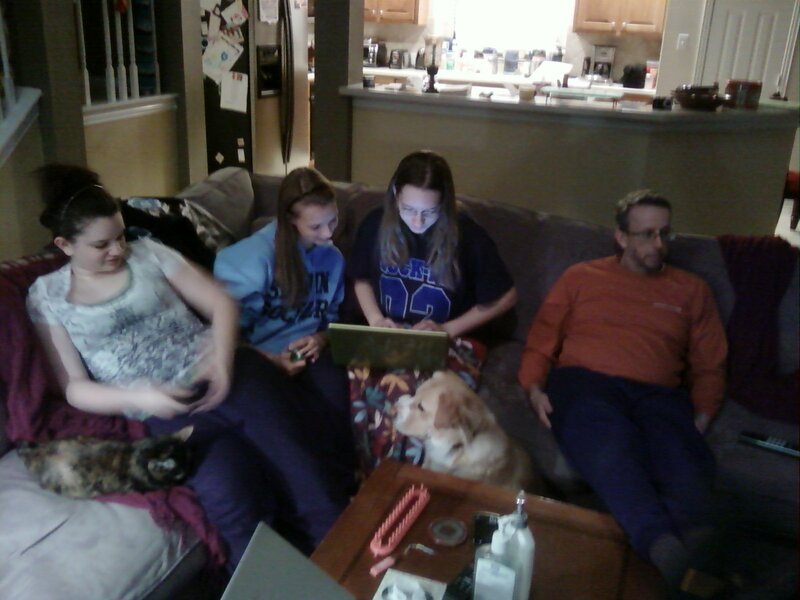 I treasure moments like this—my husband and children, their friends and our pets crammed into one corner of our sectional when we had so much snow, we were practically housebound for a week and snuggled together to stay warm. Or even the ones where we might have had a little too much togetherness. I treasure the occasion when I returned to Colorado and my small group of friends from my high school years shared a meal. I also treasure the tug of places, whether I remember them or not, knowing at some point I called them home, or that the family members who came before me did. I study my grandmother’s patio in Cincinnati. 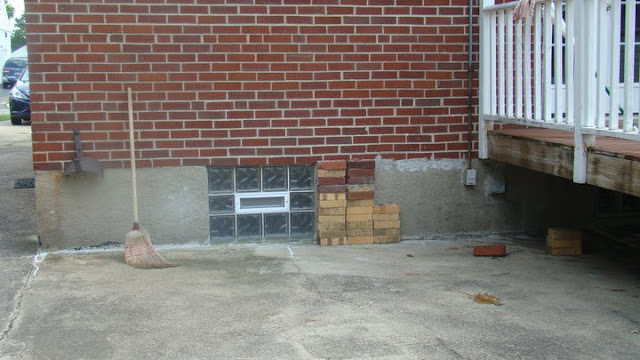 Those are the glass blocks my grandpa installed, the garden hose holder he hung. I picture myself as a toddler, using that broom to push twigs and leaves, sure I was accomplishing something very important. 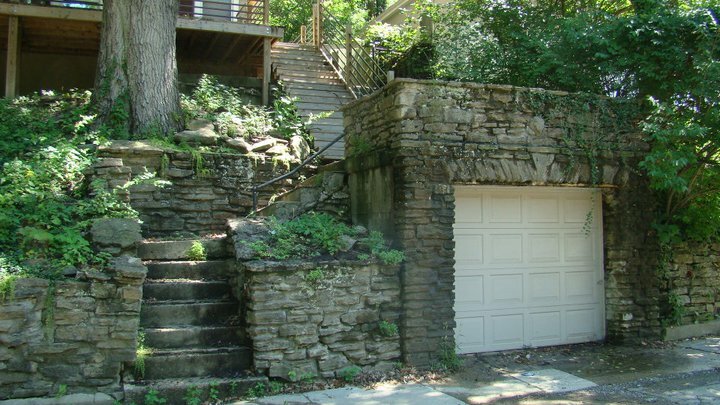 This is the limestone retaining wall and garage my dad and grandpa and their handyman built with their own hands below the house where my dad was born. I gravitate toward gravestones. Though these souls are long gone, I sense a connection, feeling almost as though I'm photographing my ancestors when I snap shots of these ancient stones. 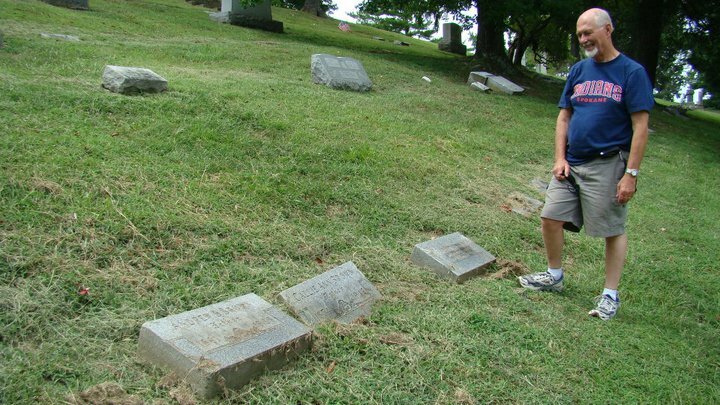 Before my great grandmother’s grave in a lush Kentucky cemetery, my dad brushes away debris and sheds unexpected tears for his grandma, his grandpa, and uncle. I scan Civil War era portraits of forbears for familiar characteristics. Do I look like them? Do my children? My son does look like his great-great-great-great grandfather, I think. Most of all, I cling to family histories, asking my parents hungry questions, caching the details that tell me who I am and where I came from, before it’s too late to ask. This shifting conglomeration of time and history and relationships. What about you? What is home? What calls you? Women's Fiction Writers, where my dear friend Amy Nathan is hosting me for an interview and a giveaway of a handmade (by me!) paper bead bracelet like the ones we made at our retreat, constructed from my cover art. 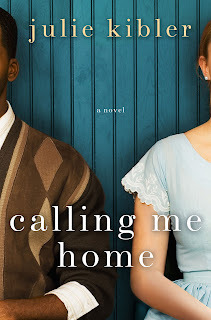 An in-depth Q&A with Jaime Boler, aka "Book Magnet"
For more than a year, we have been awaiting a special day that is almost here: the publication of Julie Kibler’s first novel, Calling MeHome, available for pre-order now and in bookstores February 12 (TUESDAY!). If you are in DFW, please join us for Julie's book launch and signing Tuesday, February 12, at 7:00 p.m. at Barnes & Noble, The Parks Mall, Arlington. Click here for more information and to RSVP (which is helpful to Julie and the store in planning for the event, but not required). It’s ironic that just when I’m writing this post, I’m a very long, long way from home. I’m in a Beijing hotel, the first of several trips for my new job, and listening to the soundtrack for Crouching Tiger, Hidden Dragon. The Chinese word for luck is fu. How fortunate and how lucky I feel to be here. Unfortunately, my first impressions of the city which apparently uses half the world’s coal supply, were colored by a charcoal sky—literally. You might have read about the horrendous air quality but actually being there, wrapped in scarves and a useless mask, it’s really quite frightening. Where are the blossoming bonsais, the silk fans, the lush trees Chow Yun-Fat and Zhang Ziyi scaled so gracefully? As I write, from outside my window a black cat whines from the nearby rooftop. His lungs must be as black as the coal he breathes day after day. Yes, I am far away. But even when I’m home in Dallas, I’m not truly home. My roots are in Maryland, where I spent 45 years. We didn’t sell the house I was swaddled in until nearly 35 years later when we moved my mother to assisted living, ten years after we buried my father. Home is where I sipped cartoned milk and napped in kindergarten. Where I walked and waxed with my poetic friend Chrissie and became enraptured with a cemetery hidden in the green hills. Where I kissed my first crush behind the elementary school brick wall. Where I played canasta and choreographed dances with my Elton-John-loving friend Diane, pom-pommed with my soul-sister Karen, drank beer (shhh, don’t tell my son) with a wild Wheaton crowd. For a few years, home was a dorm I shared with athletes and druggies at University of Maryland. Where I lucked into a CPA firm that launched my rewarding career, workshopped at the Bethesda Writer’s Center, married the jackpot of husbands, birthed the kindest and coolest philosophical son, developed forty-five years of deep, loving friendships. We left Maryland in 2005, heading the wrong way on a nine-week traverse across Europe, Japan, Alaska and finally making it around the globe to Dallas. Even though I lust to wander, whether it be across the pond or west to visit our son, Maryland does call me home. To my mother and three sisters, my dear friends, the rolling green hills. Where the sky is thankfully clear and fresh. But for the next while my home is in Dallas, where I lucked into my awesome group of writer friends and await the release of our first success story. I’ll admit it: I’ve struggled with writing this post. Home is a loaded word to me: a mix of my childhood and the childhoods of my own daughters, of my past and my present colliding in a place we call the same thing, two places that are the same yet are vastly different: Home. I’ve made no secret that I am a Kentucky girl and proud of it, even though I haven’t lived there in thirteen years and left my hometown—my real home—twenty-four years ago. I grew up in a town with a population not much more than my Texas daughter’s high school. I knew every bump of every sidewalk in that town. I knew the shortcut to Laura Gay’s house and the open field behind Stacy’s place, where we’d play kick the can with boys until called in for dinner. There was a freedom that came with home in those years. In the spring and summers of my childhood, I slept with my windows open to the cool night air. I stoked fireplaces with wood in winters, and felt the crisp crackle of autumn every October. I walked to school with my sisters, rode my bike everywhere else, went to church three times a week, and lived within blocks of my cousins and both sets of grandparents. Home isn’t just another place to me, of course. It’s another time. Yet by the time I was a teenager, home was no longer freedom; freedom was somewhere else. I left in 1989 and never lived there again. We live in Texas now, and have for eleven years. I married a California boy, and my daughters know of no other home except for the house where we currently live. Their story of home will be built around the hot white light of Texas drought, our suburban cul-de-sac in the middle of the Metroplex filled with children their own ages, and our travels to far-flung locales for vacations, including the annual road trip to Kentucky to stay a summer month with my old friends and extended family who never left. And so while a part of my heart will always be in the rolling hills of the Bluegrass state, my home is also here: the dry flat expanse of Texas, where my daughters are growing up faster than I could have ever imagined, making their memories of home as they go. My Kentucky home, in my mind, will always be magical in so many ways—not perfect, mind you, but full of love. And isn’t that what home really means? Home truly is where your heart is. When Julie started writing Calling Me Home her story immediately tugged at my heart. How could it not? I know the road that Isabelle and Dorrie follow from Texas to Kentucky. I understand the racist undertones from this part of the country and can easily imagine what Northern Kentucky would have been like in the 1930s. At the same time, I know women like Dorrie—tough and independent Texans who don't want to feel forced to rely on anyone. Julie, who was born in Kentucky, knows this road as well, and it's beautifully evident in this novel. Through her drafts and revisions of Calling Me Home, we talked more and more along the way about Kentucky memories and our present lives in Texas. One sign of a good writer is taking the seemingly ordinary journey and making it extraordinary. Julie does this with Calling Me Home. And so if home truly is where the heart is, Julie's heart is this novel. And I can't wait to see others read and enjoy this book, this book of my friend's heart.